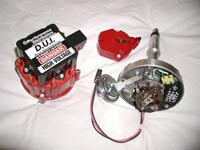 A little while back, we took you on a quick tour of Performance Distributors, originators of the high-performance version of the HEI ignition system; aka Davis Unified Ignition (DUI). This month, I’m going to walk you through the installation of their HEI-based DUI distributor, LiveWires, and Billet Aluminum Wire Looms on Déjà vu, my AMC 401-powered CJ-7. That’s right, a GM distributor in an AMC motor! If you remember the previous article, Performance Distributors makes DUI distributors for many domestic engines, including 8, 6, and 4 cylinders, as well as Toyota Land Cruisers! 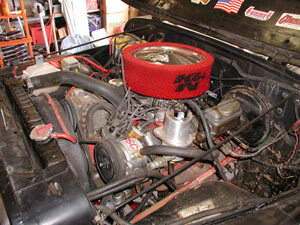 As you can see in the photos, the 401 was still using an original AMC distributor, coil, and ignition module. These are the same parts used on all V8 AMC engines, regardless of whether its displacement is 304, 360, 390 or 401 cubic inches. 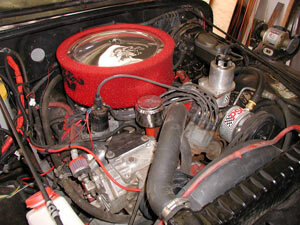 In fact, this same distributor once resided in a 304 CI engine in another CJ-7 I previously owned. This should indicate the potential for performance gains from a DUI setup! The old ignition module still worked, even with most of the protective coating melted away from years in the Texas heat. You can see where the coating actually ran down the firewall! For several years, I carried a spare module and coil in my Jeep, but not any more! Sooner or later, I knew it was going to be a problem. 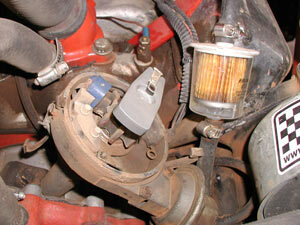 My problem actually started on the trails near Farmington, NM, with an intermittent rough idle/engine miss. Being that I run a Holley Truck Avenger off-road carburetor, and we were at an elevation of over 5,300 feet at the time, I assumed I just didn’t quite have the carb re-jetted properly from the normal near-sea-level elevations my engine is used to. Later, when problems continued at even higher elevations near Pagosa Springs, CO, some “process of elimination” diagnosis determined the secondary ignition system was the cause. Since it wasn’t a big deal, I kept on wheelin’, because I knew that when I got back to Texas I was installing the DUI system! 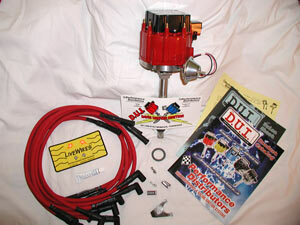 The hardest part of this upgrade is actually installing the new DUI distributor properly. Actually, it’s really not that hard…you just need to put it in just like the old one came out. Easy, right? 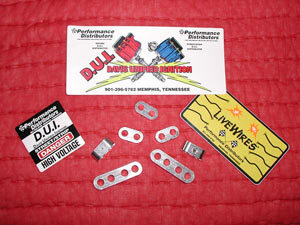 Anyway, let’s skip that for now and discuss what you get from Performance Distributors when you order a DUI system. Of course, you get a distributor, a cap (with 50,000 volt high performance coil installed), rotor, hold-down clamp, gasket, and 2 electrical connectors - 1 for power and 1 for a tachometer connection, if needed. The distributor housing will have a Dyna-Module high performance ignition module installed, and the custom timing advance weights will be marked for proper orientation should you ever need to modify your advance curve (due to future engine mods, etc.). Also, your identification number and timing specifications will be etched into the bottom side of the housing, as well. You can also see the nylon rotor screws used to help eliminate spark scatter at high RPMs - an extra precaution you won’t see others take. NOTE: The new hold-down clamp and gasket supplied with my kit appeared to be for a larger diameter GM version and will not work properly with the AMC version. Performance Distributors is working to correct this oversight and will most likely have this done before you read this. 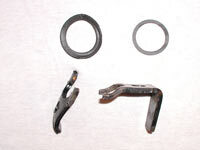 But, in the meantime use your old clamp and the proper gasket for your application. I picked one up from a local parts store for $1.99. The photo of the timing cover (with distributor removed) with the raised hold-down bolt boss shows why you can’t use the new clamp. It just will not keep the distributor from turning. A little careful planning will help make this project go a whole lot easier. Before taking anything apart, first note where the number 1 cylinder’s spark plug wire is located on the old distributor cap. (mark the cap with a Sharpie). Number one is located at the left front of the engine (driver’s side) on a V-8. 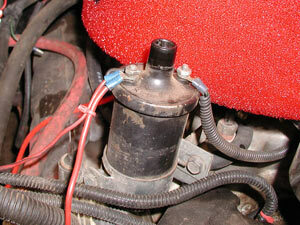 Knowing the left front cylinder is #1, follow the spark plug wire to the distributor cap and mark the cap. Since the left bank of cylinders is 1-3-5-7 and the right 2-4-6-8 (obviously!) it’ll be easy to orient the new wires accordingly. To be absolutely certain, after you mark the cap with the location of the #1 cylinder, mark the #8 location, as well, to verify distributor firing order rotation. 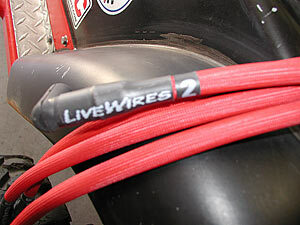 To make installation of the new custom fit LiveWires even easier, each one is marked with the corresponding cylinder number. Cool! Once you’re certain you can get the wires back in the same orientation as before, remove the wires (twist and pull at the same time) and then remove the distributor cap. Once that is done, note exactly where the rotor is pointing - the new one must end up pointing in exactly the same direction when installed! If you own a digital or Polaroid camera, take advantage of it, take photos. It can’t hurt! 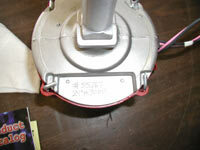 Although not as important as the direction of the rotor, take note of the direction the vacuum advance is pointing. This will help with setting the initial timing of the engine once you get ready to fire it up again. Now, it’s time to remove the old distributor. Do not, under any circumstances, attempt to turn the engine over at this point. If you do, get out your service manual! Next, remove the hold down bolt and clamp, grab the housing firmly, and carefully pull it straight up and out of the engine. At the same time, note which way the rotor turns on the way out, and its position as it stops rotating as the distributor clears the engine. 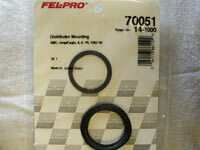 You’ll need to duplicate that position and rotation while installing the new distributor. At this point, please make certain you’ve actually read the instructions that come with your new DUI distributor. 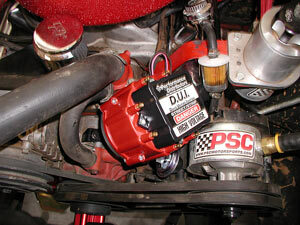 You will note that they will not all apply to an AMC motor, but they are extremely well-written, with that exception. Before you put on the new gasket to install the DUI distributor, Performance Distributors recommends that you check to be sure that your distributor does not “bottom out” when installed. 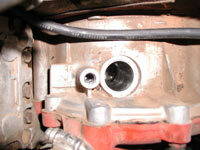 While highly unlikely, this condition could lead to damage of the distributor and engine camshaft drive gear. Not fun to fix! Take a few moments to verify that everything’s OK. Bottoming out usually only occurs when an engine has been rebuilt using milled cylinder heads, block, and/or intake manifold. Just install the distributor without gasket and while holding down the housing with one hand, check for movement of the shaft by moving the plate that the centrifugal weights are attached to. If there is no up and down movement, you will need to install shims that are available from Performance Distributors or of manufacturers like Moroso. Once this is completed, remove the DUI distributor, install the gasket, and install in the same orientation as the old distributor. You shouldn’t have to force anything. If you did it correctly, the new rotor tip should point in exactly the same direction as the old one did. Not about the same. Exactly the same! Line up the vacuum advance housing where the old one was, and install the hold down clamp and bolt, snugged down lightly. 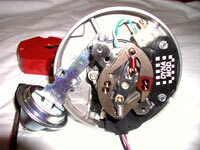 Install the rotor and/or check to make sure the nylon screws are snug, and then install the cap. Before installing the wires, we need to get some power to our new DUI distributor. 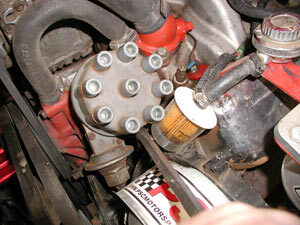 The distributor cap has 2 terminals…”TACH” on the left and “BATT” on the right. 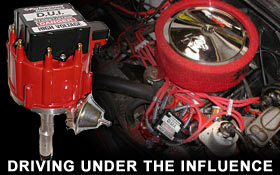 You’ll need to wire full alternator voltage directly to the “BATT” terminal for maximum high RPM operation. This means you can get rid of any ballast resistors or resistance wires that may exist on your vehicle, and run a 12 gage wire from the ignition switch. If you use the “TACH” terminal, an 18 gage wire will work just fine. In my case, all I had to do was lengthen the original coil wire by soldering on an extra 12 inches of wires with the supplied terminal. 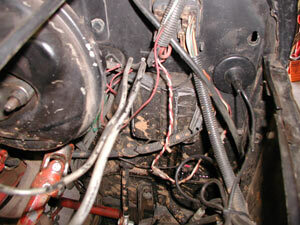 Since I use the factory CJ tachometer, no wire was necessary at the “TACH” terminal. Obviously, the old coil goes goodbye too! 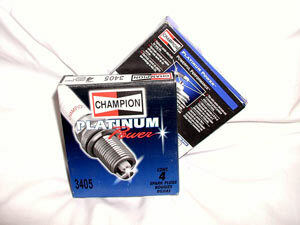 Also, prior to installing the new LiveWires, I decided to replace the old spark plugs, gapping the new Champion “Platinum Power” spark plugs to 0.55”, much greater than the original 0.35” specification. Bigger spark is better spark!